Rather than pumpkin pie at Thanksgiving (which nobody in my family likes except me) I try to come up with a new pumpkin or squash dessert each year. And, sometimes I just go back to an old favorite, pumpkin cheesecake, which I would make many years ago at MOM, our bakery, to offset the tedium of making the 100s of pies that were ordered. Sometimes I make a graham cracker crust, sometimes a chocolate cookie crust, and sometimes and gingersnap crust. Sometimes I marble it with chocolate and sometimes I just make it plain with no crust at all. I hope this recipe will become a long-standing holiday favorite in your house, too. Combine the crumbs with the butter and, using your fingertips, press the mixture together. When well-blended, pour into the bottom of a lightly buttered 9-inch round springform pan and gently pat the crumbs into the pan to make an even layer. Place in the preheated oven and bake for about 10 minutes or until just set. Remove from the oven and set aside. Place the cream cheese in the bowl of a standing electric mixer fitted with the paddle. Beat on low to blend. Add the 2 sugars and beat until very well incorporated. Add the pumpkin, vanilla, and ginger juice and continue to beat to blend completely. Add the spices and beat until blended. Add the eggs, one at a time, beating to incorporate completely. Do not over-beat or you will incorporate too much air which allows bubbles to form in the batter. The batter should be smooth and creamy so that you cake will be also. Pour the batter into the springform pan and, using an offset spatula, smooth the top. Transfer to the preheated oven, turn the oven to 300°F, and bake for about 1 hour or until set. The center may be a little wobbly, but it will continue to cook as the cake cools. 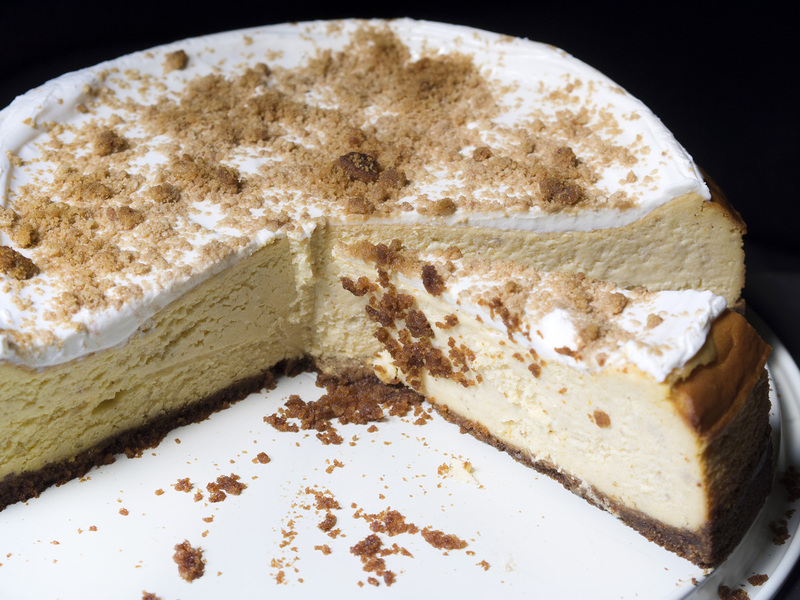 Turn off the oven and allow the cheesecake to sit, undisturbed for another hour. Remove from the oven and set on a wire rack to cool for at least 2 hours before removing the rim of the pan.